سجادی, سید جواد. (1396). کاربرد اکوستیک در تشخیص دانه های گندم آفت‏ زده. مجله صوت و ارتعاش, 6(11), 3-9. سید جواد سجادی. "کاربرد اکوستیک در تشخیص دانه های گندم آفت‏ زده". مجله صوت و ارتعاش, 6, 11, 1396, 3-9. سجادی, سید جواد. (1396). 'کاربرد اکوستیک در تشخیص دانه های گندم آفت‏ زده', مجله صوت و ارتعاش, 6(11), pp. 3-9. سجادی, سید جواد. کاربرد اکوستیک در تشخیص دانه های گندم آفت‏ زده. مجله صوت و ارتعاش, 1396; 6(11): 3-9. در این پژوهش کاربرد پردازش سیگنال دیجیتال صدای برخورد در تشخیصدانه‌‌های گندم سالم از دانه‌‌های آفت­زده بررسی شده است. دانه‌های گندم از ارتفاع 25 سانتی­متری با یک صفحه فولادی با ضخامت زیاد برخورد کرده و صدای برخورد توسط یک میکروفن به کامپیوتر منتقل گردید. سیگنال صدای برخورد توسط کارت صدا دیجیتال شده و جهت پردازش‌‌های بعدی در حافظه ذخیره شد. سیگنال‌‌های صدای برخورد دانه‌‌های گندم با استفاده از تبدیل گسسته موجک پردازش و مشخصات مناسب جهت جداسازی دانه‌‌ها استخراج گردید. مشخصات استخراج شده به عنوان ورودی شبکه عصبی مصنوعی استفاده شدند. نتایج به­دست آمده نشان داد شبکه عصبی مصنوعی با ساختار 2-6-10 قادر به جداسازی دانه‌‌های گندم سالم و آفت زده به­ترتیب با دقت 98 و 93 درصد می­باشد. Najafi Mirak, T., G. Najafian, H. Khorsandi, S. Moein Namini and G. Sharafi, “Effect of Sunn Pest Damage on Bread Making Quality of Bread Wheat Cultivars”. Seed and Plant Production Journal, Vol.29-2, No.4, 2013, pp.413-427. Ivani, A., S. Minai and D. Hosaini. “Major spectrum of walnut acoustical response to a non-desstructive impact”. Proceedings of 4thnational congress on agricultural machinery and mechanization. Tabriz University, 29-30 August 2006. Pearson, T.C. “Detection of pistachio nuts with closed shells using impactacoustics”, Applied Engineering in Agriculture, Vol.17, 2001, pp.249-253. Cetin, A. E., T. C. Pearson, and A. H. Tewfik. “Classification of closed and open shell pistachio nuts using VO ice-recognition technology”. Trans. ASAE, Vol.47, No.2, 2004, pp.659-664. Mahmoudi, A., M. Omid, A. Aghagolzadeh and A. M. Borghayee. “Grading of Iranian’s exportpistachio nuts based on artificial neural networks”. .International Journal of Agriculture and Biology. Vol.8, No.3, 2006, pp.371-376. Sajadi, S.J., A. Ghazanfari and A. Rostami. 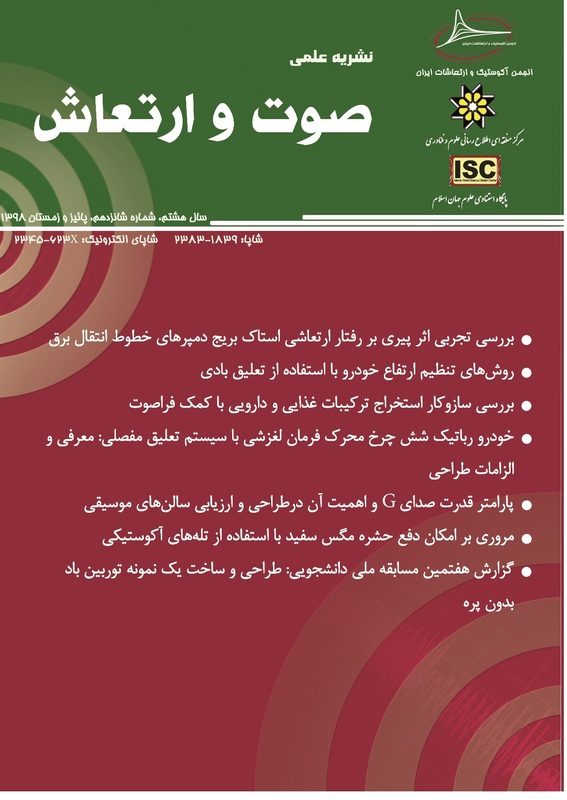 “Using wavelet transformation and neural network for detecting blank (hollow) pistachio nuts”.Iranian Journal of Biosystems Engineering, Vol.40, No.2, 2009, pp.155-161. Omid, M., A. Mahmoudi and H. Omid. “Development of pistachio sorting system using principal component analysis (PCA) assisted artificial neural network (ANN) of impact acoustics”. Expert Systems with Applications. Vol.37, No.10, 2010, pp.7205–7212. Omid, M. “Design of an expert system for sorting pistachio nuts through decision tree and fuzzy logic classifier”. Expert Systems with Applications. Vol.38, No.4, 2011, pp.4339–4347. Hosainpour, A., H. Komarizade, A. Mahmoudi and M. G. Shayesteh. “High speed detection of potato and clod using an acoustic based intelligent system”. Expert Systems with Applications. Vol.38, No.10, 2011, pp.12101-12106. Elbatawi. “An acoustic impact method to detect hollow heart of potato tubers”. Biosystems Engineering. Vol.100, No.2, 2008, pp. 206-213. Khalesi, S., A. Mahmoudi, A. Hosainpour and A. Alipour. “Detection of Walnut Varieties Using Impact Acoustics and Artificial Neural Networks (ANNs)”. Modern Applied Science. Vol.6, No.1, 2012, pp. 43-49. Khalifahamzehghasem, E. “Applying acoustic emission and neural network to classify wheat seeds from weed seeds”. .Int J Agric & Biol Eng. Vol.5, No.4, 2012, pp.68-73. Wickerhauser, M.V. “Adapted Wavelet Analysis from Theory to Software”. A.K. Peters, Massachussetts. 1994. Haykin, S. “Neural Networks: A Comprehensive Foundation”. Prentice Hall, New Jersey. 1999.